MaxTrak® is a family of industrial gas mass flow instruments from the company that has been a trusted name in industrial thermal mass flow meters for decades—Sierra Instruments. MaxTrak® will measure and control any clean, dry gas mass flow from 10 to 1000 SLPM, with lower flows and higher flows available upon request. Winner of numerous awards, Max-Trak® Model 180 instruments provide excellent accuracy and reliability, coupled with unsurpassed instrument stability, resulting from our patented inherently-linear body design, our advanced platinum sensor technology and a valve that is strong, flexible and forgiving. Max-Trak® is well-suited for dirty industrial processes such as those found in metals and ceramics manufacturing, combustion control systems, chemical processing, pharmaceutical / biotech and the food and beverage industry where it outperforms the competition by meeting the rigorous water-resistant requirements of NEMA 6 and IP67. Model 180 gas flow meters and controllers can be used in a wide variety of process environments with optional 316 stainless steel flanges (ANSI or DIN) that compliment many other popular process fittings. The extreme water-resistance, ease of installation, and rugged construction will give you confidence that Max-Trak® will continue to perform while the advanced features will provide you with information you can rely on for many years. Max-Trak® pressure insensitive mass flow controllers outperform all the competition. 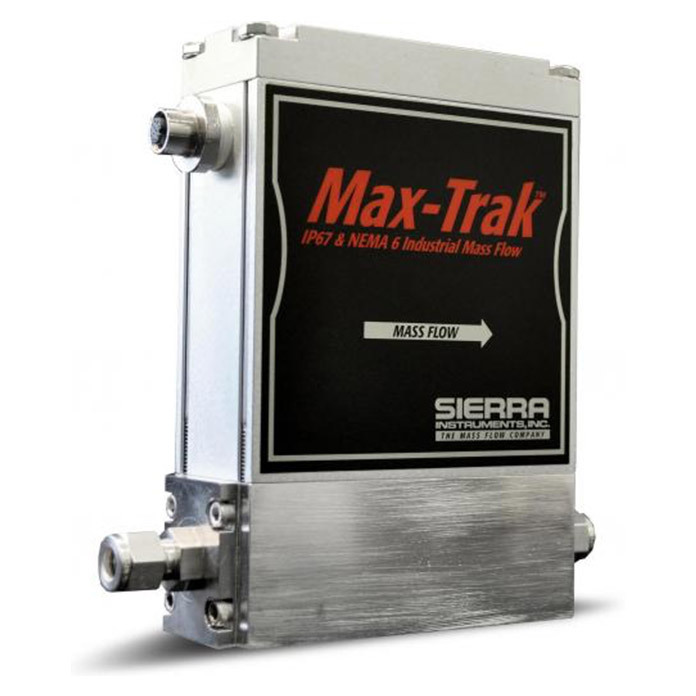 The Max-Trak® conforms to the more rigorous requirements of NEMA 6 and IP67. In addition, Max-Trak® controls gas mass flow rate from 10 to 1000 SLPM, with lower flows (to 2 SLPM full scale) available upon request. Since Max-Trak® is part of our leading edge 100 Series Digital family of mass flow controllers, it comes standard with Dial-A-Gas® multi-gas capability, both analog and digital communication, and a wide variety of field adjustable parameters. The Max-Trak® provides excellent accuracy and reliability, coupled with unsurpassed instrument stability, resulting from a patented inherently linear design, advanced platinum sensor technology, and a valve that is strong, flexible and forgiving. The 0 to 200 SLPM version also features the only fully enclosed valve design to drastically minimize leak-in paths for MAXIMUM protection. MaxTrak is available with Dial-A-Gas®, capability through a remote pilot module or RS-232 computer interface to change flow rate, modify engineering units or re-configure the instrument. With the Pilot Module, the user can set zero, span and full scale for each of 10 different gases independently to accommodate unexpected application or system design changes. Sierra’s digital communications solutions offer engineers and systems integrators, full system integration and networking capability with Sierra's mass flow controllers and meters. Digital communications solutions include: Modbus RTU. For enhanced Modbus networking capability, including two digital relays, totalization, inputs, and display, add our Compod™. Compod greatly simplifies basic flow control installations to permit networking of multiple instruments. This flexibility of communication features offers a turnkey solution for integration of Sierra's mass flow meters and controllers into any automation system or application. The operating principle of the MaxTrak instruments is based on heat transfer and the first law of thermodynamics. During operation process gas enters the instrument’s flow body and divides into two flow paths, one through the sensor tube, the other through the laminar flow bypass. The laminar flow bypass (often called LFE which stands for “laminar flow element”) generates a pressure drop, P1–P2, forcing a small fraction of the total flow to pass through the sensor tube (m1). Two resistance temperature detector (RTD) coils around the sensor tube direct a constant amount of heat (H) into the gas stream. During operation, the gas mass flow carries heat from the upstream coil to the downstream coil. The resulting temperature difference (∆T) is measured by the MaxTrak microprocessor. From this, MaxTrak calculates the output signal. Since the molecules of the gas carry away the heat, the output signal is linearly proportional to gas mass flow. Figures 1-2 and 1-3 show the mass flow through the sensor tube as inversely proportional to the temperature difference of the coils. The coils are legs of a bridge circuit with an output voltage in direct proportion to the difference in the coils’ resistance; the result is the temperature difference (∆T). Two other parameters, heat input (H) and coefficient of specific heat (Cp) are both constant. Through careful design and attention to these parameters, this output signal is made linear over the transducer’s normal operating range (Figure 1-4). As a result, the measured flow through the sensor tube is directly proportional to the gas flow in the main body. In the MaxTrak mass flow controllers, the gas which flows through the monitoring section is precisely regulated by the builtin electromagnetic valve. The normally closed valve is similar to an on/off solenoid valve, except that the current to the valve coil, and hence the magnetic field, is modulated so that the ferromagnetic valve armature, or valve plug, assumes the exact height above the valve’s orifice required to maintain the valve’s command flow (set point). The result is excellent resolution.